Three thoughts on the Utah Jazz’s 132-111 win over the New Orleans Pelicans from Salt Lake Tribune Jazz beat writer Andy Larsen. Rudy Gobert is 7-foot-1, with a 7-foot-9 wingspan and a 9-foot-9 standing reach. Compare that to the Pelicans' starting bigs tonight: We don’t know Nikola Mirotic’s standing reach, but we know his height: 6-foot-10, and his wingspan: 7-foot-1. And we know Julius Randle is just 6-foot-9, with a 6-foot-11 wingspan and an 8-foot-10 standing reach. The point: Gobert was just significantly taller and longer than his opposition tonight. So the Jazz repeatedly passed it to Gobert high, who caught the ball and dunked it. In the end, Gobert finished with 25 points on 11-13 shooting. Nine of the 11 makes were dunks. It reminded me a little bit of the Jazz’s preseason game against the Perth Wildcats, who just didn’t have anyone who could compete with Gobert down low. The Pelicans prioritizing skill in their bigs over height makes sense when they’re playing next to Anthony Davis, but he missed the game due to elbow soreness. The result was two power forwards trying to keep up with Gobert at the center position. It also reminded me of one of my favorite basketball YouTube videos: 12-year-old 7-foot Canadian Olivier Rioux just dunking all over his normally-sized peers on an 8-foot hoop. A couple other factors contributed to Gobert’s success. First of all, he was the recipient of some nice passes from his teammates. In years past, the Jazz weren’t always good at keeping the ball high on their passes to Gobert, instead sometimes trying to connect drop-off passes down low. That makes it harder for Gobert to catch and finish. But a preseason emphasis on throwing high passes to Gobert (as well as Favors) seems to be paying dividends early. “We put the emphasis on the high pass this summer, and it’s really paying off,” Gobert said. 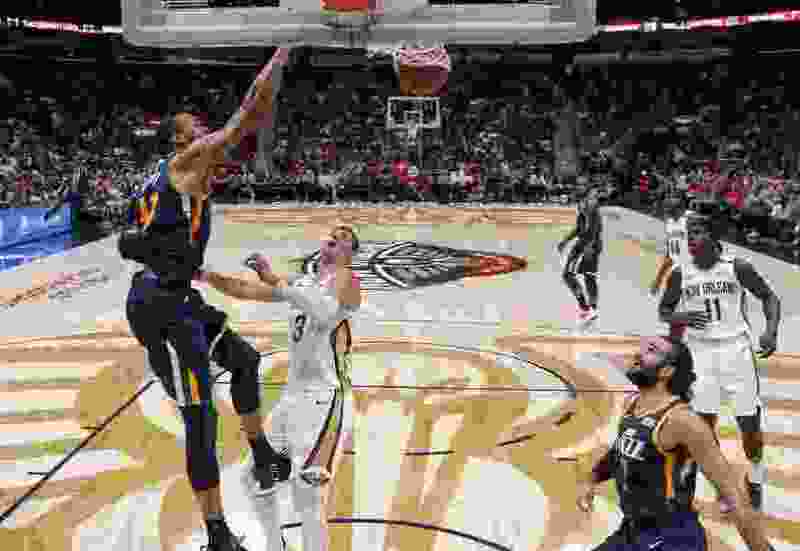 Gobert’s height advantage came out in other ways, too: he got 14 rebounds and had four blocks against the undersized Pelicans, and I actually thought he should have been credited with another swat. One of the national criticisms of Gobert’s game is how he responds when teams go small against him. But if he’s dominating to this degree inside, it’s just going to be impossible for other teams to do that. Through his first four games, Ricky Rubio had accumulated 24 points. In his fifth game, he scored 28. Rubio took shot much more in the flow of the offense tonight compared to earlier performances. Before, it seemed as if Rubio was concerned about drawing fouls, getting his defender off balance and trying to make the difficult shot. That approach is very dependent on the referees calling those fouls, though. While freedom of movement is an emphasis this year, they’re usually not talking about the ball-handler’s movement. 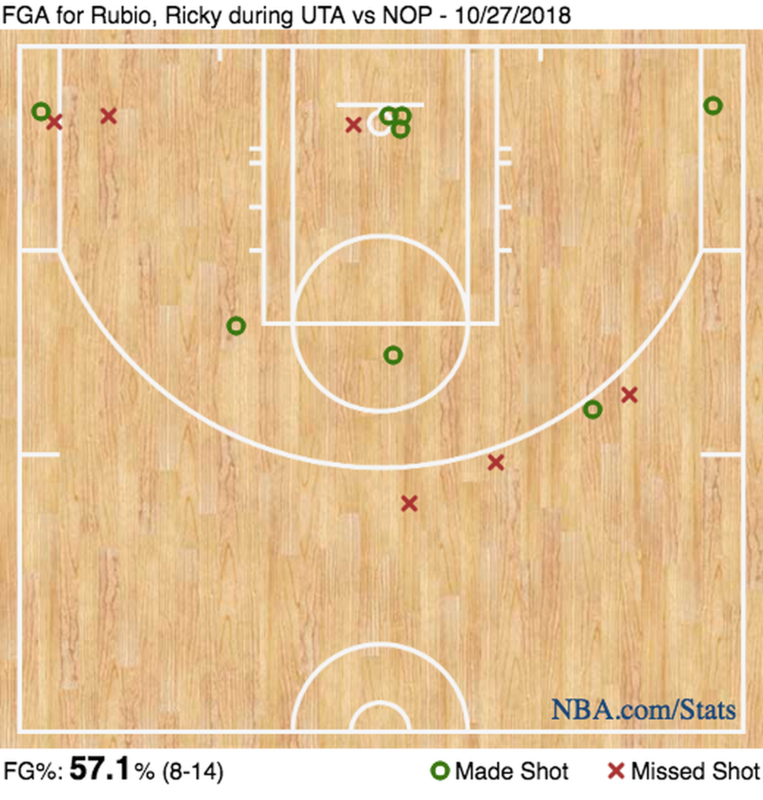 But despite not trying to go to the line as much, he actually had more free throws tonight (nine) than he had in the rest of the season combined (six). Why? Well, probably some of it is referee respect: when you are scoring in other ways, referees might be more likely to give you whistles when there is contact. But more than that, Rubio got to the line because he got fouled when the Jazz were in the bonus. Rubio clearly hunts these free throws, and tonight, he got four free points because he knew the situation and drew contact. That’s significantly easier than doing so on a shot attempt, partially because Rubio is a much better ballhandler than he is a shooter. He also had those three layups you see above. One of them came on this nice play, where Rubio goes around a Gobert screen and just drives to the hole. Why wasn’t there any help? Well, after setting the Rubio screen, Gobert went to go set a screen for someone else. That meant that Randle followed Gobert more closely than he otherwise would have on the perimeter, leaving a wide open paint for Rubio to attack. A normal pick and roll might result in a temporary 2-on-1, but this was a temporary 1-on-0. Derrick Favors found himself in foul trouble early, which meant the Jazz had to substitute in Jae Crowder earlier than they normally would. But when Crowder got tired, Favors had to play center, which meant minutes for Georges (pronounced without the s!) Niang. Niang only scored five points, hitting his only corner three plus two more free throws. Niang is a excellent 3-point shooter, and can knock them down with the best of them (45.9 percent last year in the G-League). But I was most impressed with his ability on the defense end. That was supposed to be his weak spot: relatively slow of foot, the reason Niang wasn’t already in the NBA was because of his inability to stay in front of attackers. Well, tonight, and so far this season, he’s been very good at that. Check out this play early in the second: it’s a transition opportunity after a missed Exum layup, so Niang picks up Jrue Holiday coming at him with speed. May players would end up committing a foul here, but Niang stays big, uses his feet well, and stays in front of Holiday. Holiday does get by eventually, but he’s trapped under the basket, so he has to pass it out. It’s not a great pass, and Niang recovers, taps away and collects the loose ball, and starts the break the other way. Next is what Niang is known for: he gets the ball and makes the perfect touch pass to Derrick Favors where only he can get it, and Favors makes the easy bunny layup for two points. Niang’s turning out to be a much better NBA player than I thought he would be. The slow-footedness was the knock on Joe Ingles as well, but Ingles learned to use his body and footwork to play solid defense against much quicker players. Niang, it seems, has learned some of this as well. It appears Dennis Lindsey and his staff have found a valuable contributor on the waiver wire yet again.